Touch screens on MacBooks? Why Apple is resisting standard touch ability of PCs. 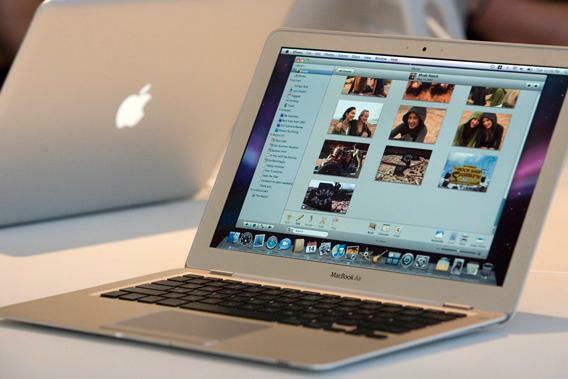 Why don’t Apple laptops have touch screens? Computers, though, flummox him. He’s especially confused by pointing devices—I’ve tried to teach him about the relationship between his fingers on the track pad and the pointer on the screen, but he’s too innocent of the ways of the world to understand such mysticism. So when I plop him down in front of YouTube on my MacBook while my wife and I try to enjoy a lovely dinner—see that email address above—he always gets confused when a video ends. He reaches for the screen and repeatedly taps to get a new clip to play. It’s pretty funny, actually. And then he whines for me to help him, which is kind of annoying. But of course, my kid is totally right. Why doesn’t the MacBook screen respond to his touch? In the couple of years since my son was born, nearly every screen that we interact with has become touch-enabled. Your phone, tablet, Kindle, GPS, car radio, and maybe even your fridge—you can tap that. But not your computer. Or, more specifically, not your Mac. Last fall Microsoft released Windows 8, which brings touch capabilities to the ubiquitous PC operating system. This year PC makers are putting out dozens of touch-enabled Windows 8 laptops and desktops. Or consider Google’s new Chromebook Pixel, which has a brilliant high-definition display screen that responds to touch. At $1,299, the Pixel is a high-end machine, but what’s most interesting about touch screens is that they’re quickly becoming a standard feature even on low- and mid-range machines. The Asus VivoBook, an 11-inch touch-screen laptop, sells for under $500. The HP Pavilion TouchSmart goes for $649. * When you get to machines classified as “ultrabooks”—the thin and light PCs that are meant to compete with Apple’s MacBook Air—it’s hard to find any that don’t have touch screens. The Acer Aspire S7, the Asus Zenbook Prime Touch, and the Samsung Series 7 Chronos—which go for around $1,100—can all be touched. You’ll spend around the same for a Mac, but if you touch its screen, all you’ll get are smudges. I should note that the new touch PCs don’t dispense with track pads or mice; you’ll spend most of your time controlling them through those traditional means. But they also allow you to touch—if my son tapped a YouTube clip on the Pixel’s screen, the video would start playing, and I’d be able to continue eating dinner in peace. The rise of touch-enabled computers raises two questions. First, what’s the point: Do you really need to be able to touch your computer’s screen rather than use a track pad or mouse? And second, why is Apple—the firm that has done more to stoke our collective touch-screen fervor than any other—apparently holding out against touch on its computers? To answer the first question: Yes, a touch screen on a PC can be useful. Over the past few months I’ve used a few touch-enabled Windows 8 PCs, and during the last week I’ve been playing with a Chromebook Pixel that Google sent me to review. I’ve found their touch screens to be handy—the screen complements the keyboard and the track pad quite naturally, making for one more way to get your computer to do your bidding. I wouldn’t go so far as to say you need a touch screen on your PC. Touching the screen doesn’t allow you to do anything you couldn’t do on a nontouch PC. But like other high-end laptop features—a backlit keyboard, a slot for an SD card, a high-definition display—a touch screen is a nice thing to have. I found myself touching the screen during a few primary tasks. If I pulled up a long article on the Web and sat back to read, I’d sometimes reach for the screen to scroll down rather than hit the keyboard or flick at the track pad. I did the same when I was flipping through photos. Windows 8 has two completely different interfaces—a traditional “desktop” mode in which you click on small icons to launch programs that run in multiple windows on your screen (i.e., the Windows we all know and love), and a “modern” mode in which apps occupy the full screen and feature large, touch-friendly buttons. When I used this second mode, I found myself touching more often—to browse Amazon or Netflix, to read the news, or to play games. You may have spotted a pattern there: I tended to touch for leisure activities, and I’d stick to the keyboard and track pad when doing work. But this wasn’t by design, and I only discerned the leisure-vs.-work behavior when I thought about it later. Indeed, while using these touch laptops, the touching became intuitive and invisible. I flitted among the screen, the track pad, and the keyboard from moment to moment without ever having to think about it. I didn’t expect to take to touching my PC. The conventional criticism against adding touch to laptops is that it’s unnatural. When you use a laptop, your hands usually rest on the keyboard, which is relatively far from the screen; from that position it’s easier to reach for the track pad than the display. The other problem is what’s on the screen. On a PC—even a Windows 8 machine with an interface specifically designed for touch—there are lots of small controls that are better handled with a precise pointer than your fat finger. For instance, to close a tab in the Chrome browser, you’ve got to hit a little X next to the tab’s title. I’d often miss that X when I tried to hit it with my finger. That was a bit frustrating—although after a few times making that mistake, I learned to stop trying to close tabs with my finger, and then I didn’t get annoyed anymore. And that’s too bad. Last month I spoke to Tami Reller, Microsoft’s chief marketing officer for the Windows division, and Aidan Marcuss, a principal director for Windows Research, at the company’s San Francisco office. On their trip from Redmond, Wash., Reller and Marcuss had brought along several touch-enabled Windows 8 laptops, which they described as being the future of computing. “For consumers—for mainstream laptops—they’ll be increasingly all be touch,” Reller told me. This wasn’t an idle prediction. Reller’s position was bolstered by data. Throughout the development of Windows 8, Microsoft has been tracking anonymous usage data from people’s computers. It has now collected more than 1.2 billion hours of data—more than 700 centuries—about how people use Windows 8. And the data is definitive: It shows that when people are given PCs with touch screens, they use them. Soon, you too will be reaching out and touching your laptop—unless it’s a Mac. Correction, Feb. 28, 2013: This article originally misspelled the name of the HP Pavilion TouchSmart.